The Beyond Food Community Interest Company was founded by Simon Boyle. The charity works with people who have been at risk of or experienced homelessness. By providing culinary training and other support, Beyond Food motivates and inspires people to gain meaningful, long-term employment. Simon Boyle's charitable mission began in 2004 when he volunteered in Sri Lanka in response to the Indian Ocean tsunami. Seeing the international community pull together to help those who had lost everything compelled Simon to do more for his own community when he returned back to the UK. Simon wanted to create an organisation that broke the cycle of poverty while bridging the gap between the corporate and social sectors. Using the skills he knew best, Simon started using his passion and training in cookery by teaching cookery lessons and sessions on healthy nutrition on a budget at homeless hostels. Over time, this work expanded, leading to the development of Beyond Food. The philosophy remains the same: good food creates the basis for getting back to work. The Beyond Food charity operates a six-week course, Freshlife, which has so far helped more than 1,200 people who have been at risk of homelessness. The course equips them with cooking skills and key knowledge about healthy eating and nutrition. As the course goes on, participants are encouraged to start planning their own futures. Additional support is provided for them to recognise and develop employability skills, while advice on anything from debt to housing options is also provided. After completing Freshlife, participants have the option to join the five-week Get Stuck In course. This includes three weeks of work experience in a professional kitchen and the opportunity to earn up to seven accredited certificates in culinary skills. This programme also includes personal development workshops, to help participants understand different aspects of gaining and keeping meaningful employment. At the end of Get Stuck In, participants are invited to participate in interviews for the Beyond Food United Kitchen Apprenticeship, based at Brigade restaurant. This two-year intensive programme results in a certified qualification: an NVQ Level 2 Diploma in Professional Cookery. 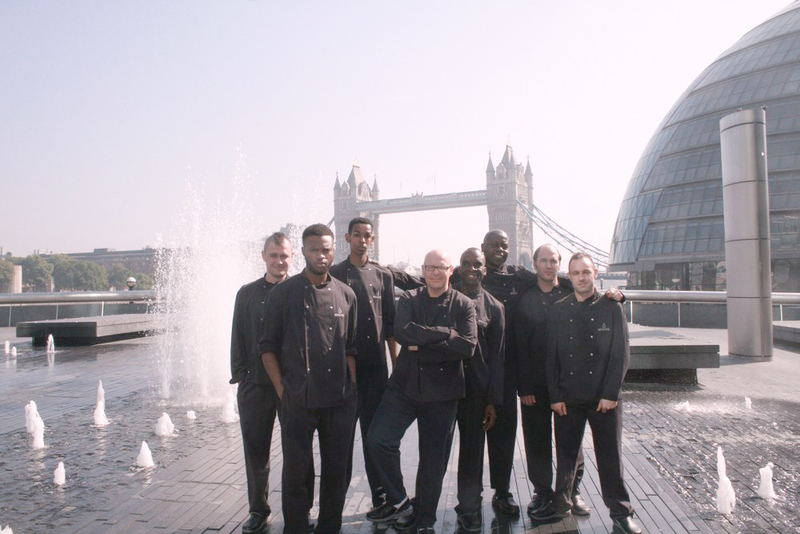 The apprentices go on to train for six months at Brigade, before entering seven-month work placements in some of the most renowned restaurants and hotels in London, including The Savoy Hotel, Corbin & King Restaurants and Bruno Loubet’s Grain Store. So far, 106 out of 123 apprentices have graduated from the United Kitchen Apprenticeship. Former Prime Minister David Cameron visited United Kitchen apprentices at Brigade. A career in professional cookery isn't for everyone, and Beyond Food also supports those who are interested in working in the catering industry more broadly. Out Front is a four-week professional development course for those who are interested in working in front of house roles in the hospitality sector. By imparting skills, helping vulnerable people gain qualifications and providing practical support to help participants find stability in other areas of their lives, Beyond Food is tangibly changing lives.